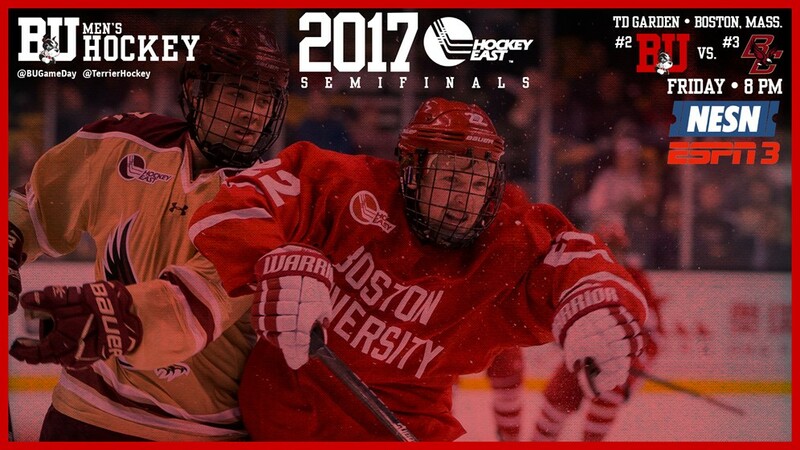 In the 274th renewal of the Commonwealth Avenue rivalry, #7 BU takes on arch-rival #14/15 BC in the Hockey East semifinals at TD Garden. Puck drop is scheduled for 8 p.m., following the first semifinal between UMass Lowell and Notre Dame. Both contests will be broadcast on NESN and also will be available online on ESPN3 outside of New England. BU and BC have met in the Hockey East semifinals four times with BU winning three, including a 6-3 triumph in the most recent meeting in 2013—the final victory in Jack Parker’s coaching career. Terriers, who will be the home team tonight, won all three previous match-ups with the Eagles this season: 2-1 and 3-0 in January and 3-1 in the first round of the Beanpot Tournament. The Eagles will be playing to keep their season alive as a loss would virtually end any chance of an NCAA bid. For BU, which has already punched its ticket for nationals, a victory would put it in the Hockey East title game for the third time in five years. BC, which went 0-5-2 in its final seven regular-season games before scoring 14 goals in a two-game quarterfinal sweep of Vermont, is led by seniors Austin Cangelosi and Matt Gaudreau with 34 points each, sophomore Colin White (33) and junior Ryan Fitzgerald (28). Freshman Joseph Woll has a 2.61 GAA. Bobo Carpenter and John MacLeod have recovered from injuries suffered last weekend and will be in the line-up, while Nikolas Olsson remains sidelined. Charlie McAvoy was named a first-team Hockey East All-Star, while Clayton Keller gained Rookie of the Year honors at Hockey East’s Awards Banquet at TD Garden. 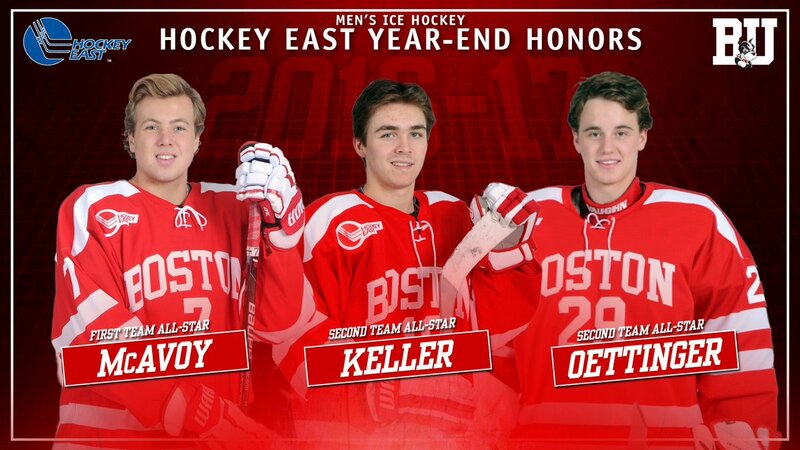 Keller and goalie Jake Oettinger were named second-team All-Stars. Keller, who is BU's top scorer with 40 points, was Hockey East Rookie of the Week five times and Rookie of the Month three times. He becomes the ninth Terriers to earn top rookie honors joining current assistant coach Scott Young, Scott Cashman, Rick DiPietro, Brandon Yip, Colin Wilson, Kieran Millan, Charlie Coyle and Jack Eichel. 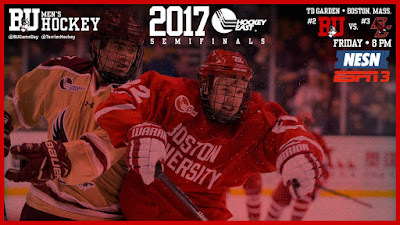 ►In the latest installment of his 2017 Draft Diary for NHL.com, Oettinger discusses the Hockey East semifinals and facing off against his friend and BC goalie Joseph Woll. The two netminders were teammates for two seasons with the USA Hockey NTDP program. ►McAvoy is among the guests on this week’s edition of Hockey On Campus. Bernie Corbett also will talk with BC’s Austin Cangelosi and Notre Dame’s Cal Petersen.